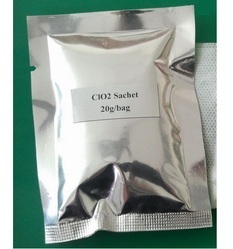 Rapid Oxide Sachet is a chlorine dioxide generating Sachets. There is no “chlorine dioxide” in the Sachets. It generates chlorine dioxide when comes into contact with water or when exposed to moisture in ambient air. It is the easiest way to deliver high purity chlorine dioxide at the point of use. Sachets are the most ideal for small and medium applications. Step 1: Cut the Rapid Oxide Sachets from packaging. Rapid Oxide Sachets - 10gm: 1 ppm Chlorine Dioxide in 1250 liter water. Rapid Oxide Sachets - 20gm: 1 ppm Chlorine Dioxide in 2500 liter water. Rapid Oxide Sachets - 30gm: 1 ppm Chlorine Dioxide in 3750-liter water. Rapid Oxide Sachets - 40gm: 1 ppm Chlorine Dioxide in 5000-liter water. Rapid Oxide Sachets - 50gm: 1 ppm Chlorine Dioxide in 6250-liter water. Rapid Oxide Sachets - 100gm: 1 ppm Chlorine Dioxide in 12500-liter water. Looking for Chlorine Dioxide Sachet ?